I’m thankful and I know I’m fortunate to have had the chance to interview Spike Dykes and build the Midland chapter of The Republic of Football around that conversation. Spike graciously welcomed me into his home and I had as much fun seeing the memorabilia in his man cave as anything else on my visit. Few men in the history of football in Texas have contributed as much as Spike did as an assistant coach to both Emory Bellard and Darrell Royal, a head coach at Midland Lee, Belton, Big Spring, Coahoma and other high schools in Texas, and as the head coach who led Texas Tech into the Big 12 and succeeded in getting a foothold in the new conference. The most revealing thing I learned about Spike in our last visit was that he got into coaching simply for the camaraderie. To me, that’s Spike describing Spike as succinctly as anyone ever could. This entry was posted in Uncategorized on April 10, 2017 by csconine. 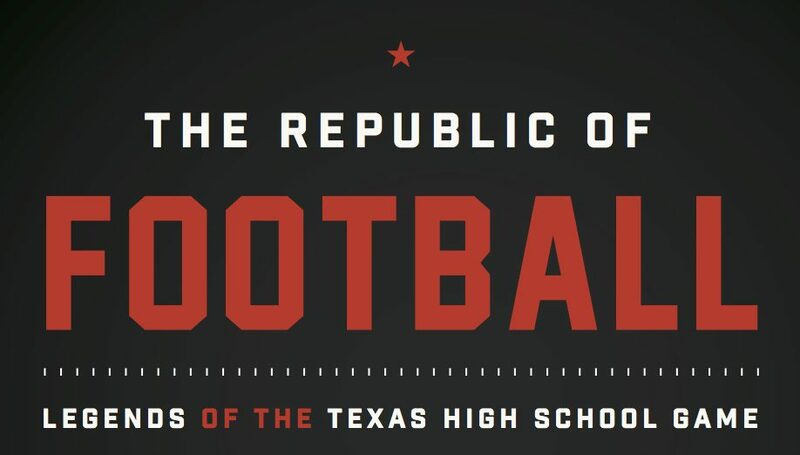 It’s kind of amazing to think it’s been four months since we introduced “The Republic of Football: Legends of the Texas High School Game” to the world at the Texas High School Coaches Association’s annual Coaching School in San Antonio. I’ve had so much fun speaking with people about this book and I’ve been humbled by how well it’s done so far and the things people have said about it so far. I also told them that I first wanted to write a book after I read “Friday Night Lights” when I was in middle school and that’s the sincere truth. And now, the productive part of the rest of my week will be spent in high school stadium press boxes covering the opening round of the high school football playoffs for the Waco Trib. This season has stoked my excitement for high school football, obviously because I’ve been promoting my book. But also because I have renewed appreciation for the place that high school football holds in the sports spectrum. High school football is the team in town that we can all pull for. High school football keeps our expectations in check. High school football is where we start to see great players emerge. But, more importantly, we see them in the context of a great team (or we probably won’t be seeing them much longer as the playoffs are a survive-and-advance business). So here’s my pitch: the high school football playoffs offer the most fun-per-dollar of any sport out there. If you have a team, I hope they keep playing right up until Christmas. If you don’t have a team, I strongly advise adopting one. And if you’ll pick up “The Republic of Football” and read it as the playoffs progress the next six weeks, I believe it will be a good primer. This entry was posted in Uncategorized on November 9, 2016 by csconine. This entry was posted in high school football and tagged high school football on June 29, 2016 by csconine.